Another steenking hot day here, not at all funny if you have swords in your face! I admit to being a little lazy during the vegetarian festival, but finally this morning was up before dawn and went to Kathu Shrine for the start of their procession. The last 2 years I only watched the procession, this time was different - a lot of photos will be on Jamie's Phuket in the next couple of days. This is a weather blog, so no need for pictures of pierced faces here! I'll just say again, it was a hot day in Phuket. Tomorrow is the last day of the vegetarian festival, then its full steam ahead and into high season. 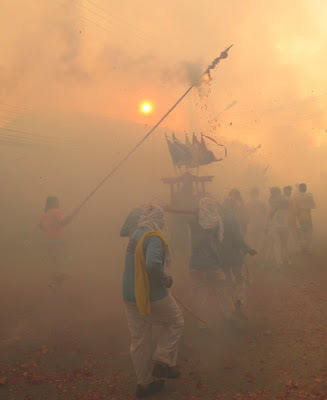 Photo below - carrying the gods through a hail of firecrackers in Kathu village, about 7am this morning.